My dog Veronica is my co-pilot. 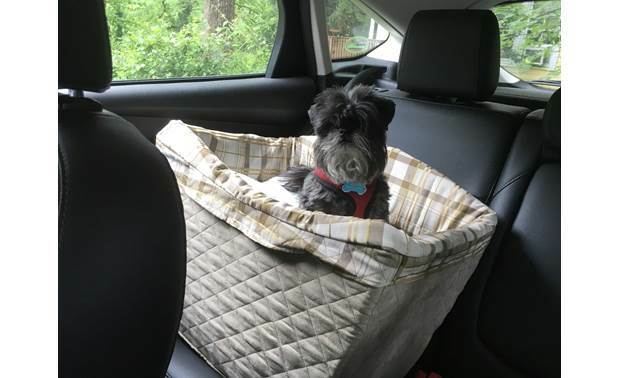 PetSafe Deluxe Pet Safety Seat - Crutchfield intern Milo enjoys his new view. My dog Veronica is my co-pilot. She always wants to ride in the front seat, and she loves looking out the window. Being able to see the scenery also reduces the likelihood she will experience motion sickness (something everyone in the car will appreciate). As a medium-sized dog, this isn't a problem for her. But small dogs can't see outside on their own, so they need a boost from us. The Deluxe Pet Safety Seat is a booster seat, but it's also much more. Underneath that cozy bed is a rigid internal structure that integrates with your car's seat belt. Speaking of seat belts — your pup gets his own! There is a safety tether included so that your dog stays put, even if you have to slam on the brakes. "I liked it. Assembly and installation were very simple, and it felt much sturdier than other boosters. I was concerned that the latch on the built-in tether wouldn't fit his tiny harness, but it did. I also appreciated the fact that the bed and cover were removable for easy cleaning. Milo is used to traveling in crates, so it took him a while to get used to seeing everything. He whimpered a bit, but I think it was because he was excited. I could tell he really liked the soft bed because he started to dig around like he was nesting." 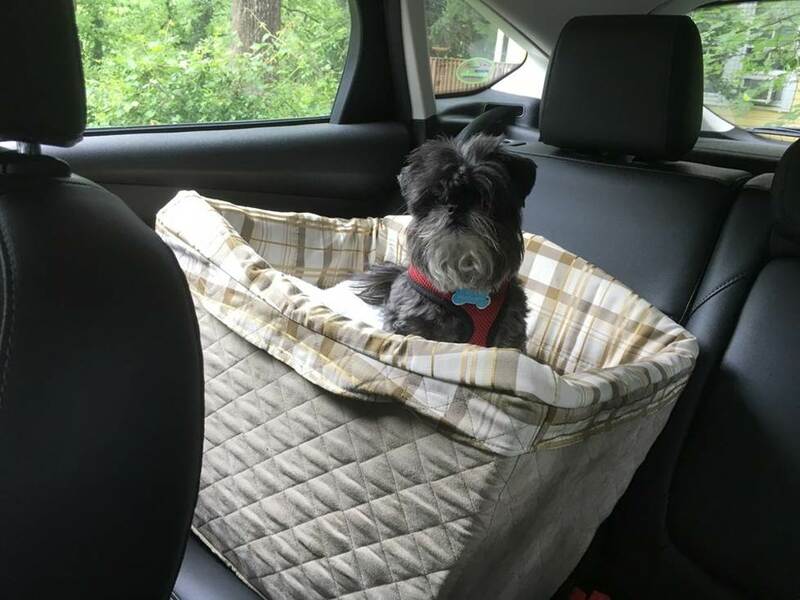 Overview: The Deluxe Pet Safety Seat, from Solvit Products, provides a safe way for your dog to ride in the car with you. The safety seat features a rigid internal frame, and integrates with the vehicle's seat belt for added security. Your dog rides elevated 9" above the seat, providing a clear view out the windows, while the included tether prevents wandering around the vehicle. The removable liner is machine washable so it'll always look and smell fresh. The Pet Safety seat assembles in minutes without the need for tools. 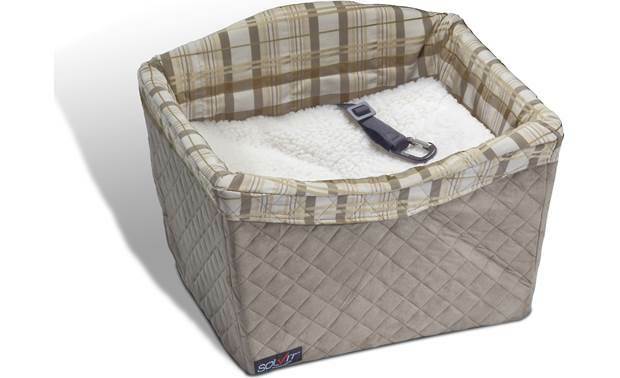 Dimensions: The fully-padded seat has a roomy interior to give your dog space to relax. The seat area is 19.5" x 14.5" at the top, tapering to 18" x 14" at the bottom with 8" tall sides. External dimensions are 22" wide, 17" high, and 17" deep. The Pet Safety Seat weighs 7 pounds, and is designed to accommodate pets up to 30 pounds, or multiple smaller pets. 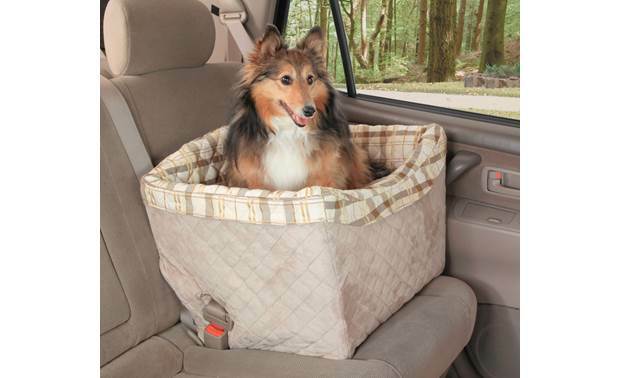 Materials: The Deluxe Pet Safety Seat has a rigid Safe-T-Core frame that comes in four interlocking parts: left and right walls/front and rear struts. The seat area is a three-panel piece that make up the bottom panel and front and rear walls. The pieces fit together with locking tabs. The cover features a quilted faux suede shell with a quilted plaid liner. The shell slides over the frame on all four sides and zips into place. The top fabric liner fits over the top of the frame and is held in place by hook-and-loop strips. Finally the reversible pillow is inserted to complete the assembly. The fabric pieces are machine washable in cold water, and either line dried, or machine dried without heat. Safety Features: The Safety Seat has been crash-tested in a DOT-approved facility. The basket features slits on the sides near the back to accommodate the vehicle's seat belt. Since the seat belt goes in front of the frame, the entire seat is secure. The seat has a safety tether that attaches to the dog's harness to keep him securely in the seat. The tether has been tested to 2000 pounds so you know it's secure. It is recommended that you use a harness on your pet instead of a collar when placing him in the safety seat. Searches related to the PetSafe Deluxe Pet Safety Seat Padded booster seat with tether.